Under state law and regulations adopted by the New Jersey Election Law Enforcement Commission (ELEC), any person who is compensated directly or indirectly, or reimbursed more than $100 in any three-month period, to influence legislation, regulations, or governmental processes by communicating with (for more than 20 hours in a calendar year), or providing a benefit to a state official, is required to register as a "governmental affairs agent." Registered agents must submit periodic reports with ELEC on their receipts, spending, clients and matters on which they have been retained. "Governmental affairs agents" are more commonly known as lobbyists, and those who are available for retention by others to represent their interests--typically companies, labor unions or other special interests--are sometimes referred to as "contract lobbyists" whose clients are designated under the statute as "Represented Entities." Lobbying also is conducted directly on their own behalf by a variety of associations, business and labor entities and individuals, who also must register as agents. 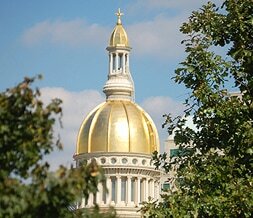 In recent years, the groups spending the most have included the New Jersey Education Association, which represents public school teachers and other school employees, the New Jersey Hospital Association, and the New Jersey State Bar Association. The average number of lobbyists fell to 900 in 2017, the lowest point since 2005 and 14% below the peak of 1,043 in 2008. The number of clients fell to 1,923, a total 7% beneath the record number of 2,077 in 2012. For the fifteenth straight year, in 2017 the Princeton Public Affairs Group reported the highest receipts among multi-client contract lobbying firms with $9.2 million. It was followed by Public Strategies Impact ($6.1 million); MBI Gluckshaw ($3 million); and Kaufman Zita Group ($2.7 million). ​ In addition to lobbying with public officials, campaigns to influence the general public ("grassroots lobbying") to contact state executive officials or legislators on legislation or regulations are also subject to reporting requirements if they exceed $2,500. ​ Gifts to public officials--once common in the form of honoraria for speeches, free tickets for entertainment and sports events, and travel, dining and lodging for dinners, conventions and conferences--have dropped sharply as a result of restrictions now limiting spending to no more than $250 per year to officials and their immediate families. In most cases, even at the $250 level, lobbyists and officials have concluded that the potential adverse publicity relating to such gifts outweighs any benefit to either the donor or recipient. ​ Lobbying expenditures totaled $90.8 million in 2017, a 0.5% increase from the previous year, according to an analysis of annual lobbying reports released by ELEC. Issues such as an aborted raid by the Christie administration on the surplus funds of Horizon Blue Cross Blue Shield of New Jersey, the state’s largest health insurer; a request by Public Service Enterprise Group, the state’s largest electric utility, for a special $300 million per year surcharge to keep three nuclear plants running, and a proposed increase in the minimum wage opposed by small businesses such as restaurants, all contributed to heavy spending in 2017. Horizon Blue Cross Blue Shield spent $2.5 million--the most of any one organization--in successfully opposing the effort of Governor Christie to divert reserve funds of Horizon for programs to combat and treat opioid addiction. Lobbyists attend a diverse range of meetings, conferences and conventions throughout the year to keep informed of legislative and governmental actions and to take the opportunity to develop relations with public officials. The largest events are the annual "Walk to Washington" chartered train trip and dinner in Washington in February sponsored by the New Jersey Chamber of Commerce and the annual Legislative Correspondents Club Show and Dinner in May sponsored by the New Jersey Press Association and Legislative Correspondents Club which features skits parodying issues and political leaders.